A TeachingGame between Scartol and JamesA. Scartol Black 92: If White connects, then my black stones are in Barney. Did I do this right on the diagram? Scartol Black 94: Not sure how useful this will end up being, but I like the way it feels. JamesA: White 95: I think this is OK, but see what you can do. Scartol: This looks to be the move that will serve the most functions. JamesA: Good move - time for White to compromise! Scartol Black 98: YAY!! (dancing in my desk chair) I got 'em out! Huzzah! JamesA: Yup, your analysis looks good to me! Therefore, I think I will have to play crudely. But first, White 81. Scartol: Hmm. The capture at a would let White play at 2, forcing Black to connect. 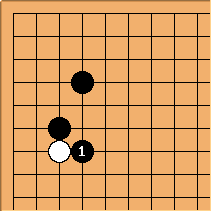 White could then connect at b and make some progress. Of course, Black 82 lets White play atari at c and possibly break out into the center. But I like the idea of not having large black groups in atari, and forcing White -- if she chooses to use atari -- have to spread many single stones around. JamesA: Well, here goes nothing... By the way, 82 is a great move - gets rid of a fair bit of aji in that area and is rock solid. White should suffer now. 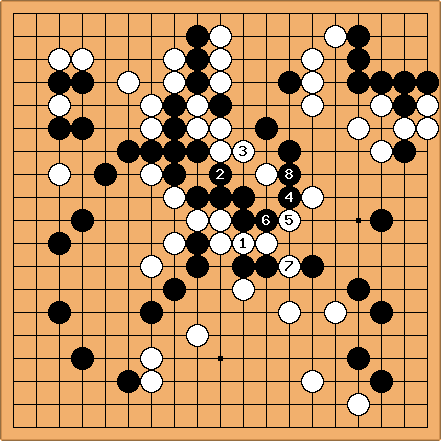 Scartol: Black 84 seems to be the only move. I'm worried about White moving out to d, but I think I can keep her contained if she does. JamesA: White 85 is the only move. I'm not sure about Black 84, I think I would have played it at a. The point is that a would guarantee a connection with the marked black stones - Black 84 doesn't. However, perhaps Black 84 threatens the weak white group more - we shall see! Scartol: Well, I thought about playing the hane at e, but I feel like that will stretch me out too thinly. So instead I'll extend to Black 86 and make my plans on a larger scale. I'm pretty sure I can still keep White in. Scartol: So before White had to play crudely; now black has to be very careful. Did I slip up somewhere (was Black 84 really that bad)? Or is this just an unforeseen set of circumstances? Now I'm stretched too thinly. 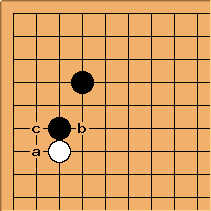 Now a and b are miai for White. Hmm. Accepting the possibility that the wandering white group may link up to one other stone, I wonder if this sequence might not be too bad, so long as I keep the whole thing contained with 5? Of course, with each stone that connects, the process gets tougher. But this feels like my best option.. If nothing else, I'm reaching toward the POWs up top. Let's play it. JamesA: Yup, I don't think there is any need for Black to try to kill the white group - perhaps if you've made any mistake earlier it was in trying to do so. 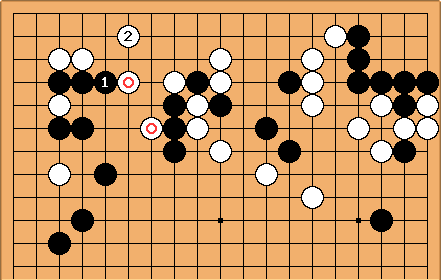 Using White's weak group to try to rescue your stones above is a much better idea, but is it still possible? It would have been much easier (well, guaranteed!) if Black 84 had been played one point higher but let's see what happens. Notice that Black would much rather have the squared stone at c, threatening to cut at d and make a mockery of White's invasion. 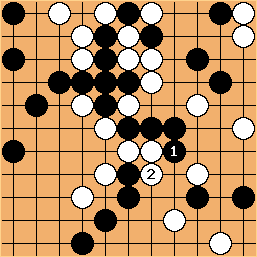 The squared stone was a slack play made by Black earlier. Scartol: Okay, well. 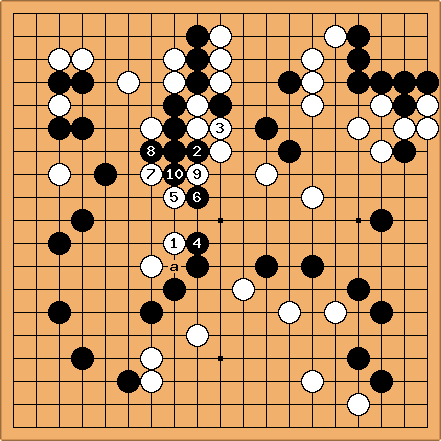 Black 90: I still feel like this is a good move. JamesA: White 71: Right then - it's time for me to start squirming! Black 70 threatens to capture my stone on a very large scale so I feel I have to run. Personally, I think Black 70 may be a little loose - it gives me too much space to cause problems. A play at a would be much more secure and I think White would need to make some sacrifices to survive. Scartol: Yeah, you're right. However, I think I can use the dead stones up top to capture those two and get some territory in the lower left. It will get interesting, if nothing else. 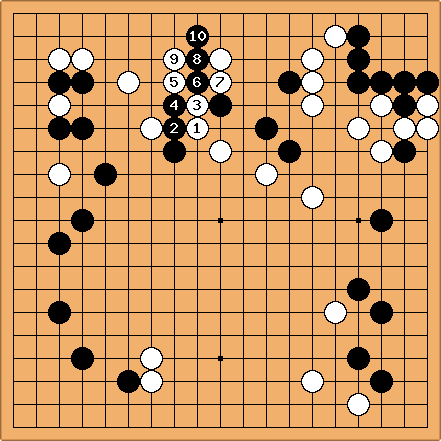 JamesA: White 73 - no other move. I'm sorry I've not moved for a while but I've been moving house. The job's now done so I will update more regularly. Scartol: No problem about the posting. Maybe I was hasty in stating that I would be able to capture those two. But let's try it. Scartol Black 76: Well, heck. I've never been afraid of a little fighting. JamesA: That's the spirit! Now, what will you do about White 77? Scartol Black 78: Make trouble. What else? JamesA: Once again, work finds a way to fill up my life... Sorry for the delay! White 79 - time for tricks (I just hope they work). What if White plays this way? Well, I'd like to play at White 4, in order to get out. But 3 seems more urgent. So when White plays 4, Black is trapped in a ladder. With the moves to 9, however, it seems like I can break the ladder. Hmmm. And even if hite extends instead with 6, Black has two liberties and can still play the double atari. What if White plays 6 here? I feel like I can still catch the white stones on the left. OK, let's play this way. Scartol: Yeah, I guess you're right . In light of the massive loss I suffered last night due to just this kind of obstinacy, perhaps I'd be wise to tenuki. Let's see what I can get by moving out in the middle with Black 62. 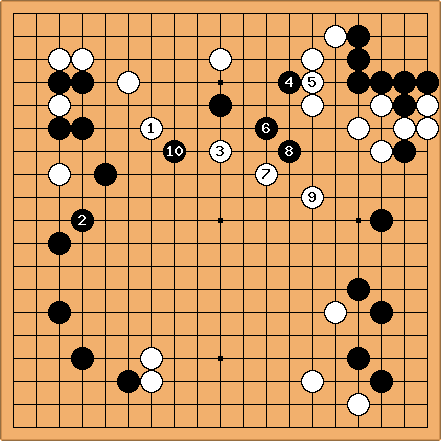 JamesA: Black 62 looks like quite a smart move to me. I'll start work on my bottom moyo with White 63 and see how you respond. Scartol: Thanks for those comments, guys. I just wish I had thought of that sooner. Oh well, hopefully it will serve me in the future. As for Black 64, I'll keep pushing in. It would be lovely if I could surround the white stones above and free my trapped soldiers, but I doubt that will happen. Still, they tell me I'm supposed to keep White separated, so that's what I'll do. JamesA: White 65 - can you spot my subtle plan? Scartol: Well, I can tell that you're trying to build a nice thick wall, which will happen if I push at a, White plays b, I play c, etc. So instead, let's see what happens if I try a more obstinate Black 66. JamesA: That's the attitude! Thwart my plans! 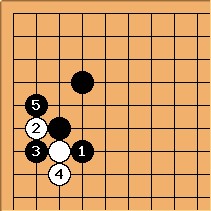 I think Black 66 is a really good move - it reduces my bottom moyo and expands your side at the same time. Now, what will you do about White 67? Scartol: Well, it looks like White is trying to dragnet Black 66. If I were White, I'd like very much to play at Black 68, so I'll play there before you do. I'm not 100% certain I can make it out alive, but if nothing else, White will get stretched pretty thin in the effort, which is likely to help me. Scartol: Hello? JamesA? It's been about a week since anyone moved. Just wondering what the scoop is..
JamesA: Sorry, I had an extremely busy few weeks, which is continuing. White 69 - I'll leave my little stone on its own. Scartol: No problem, no rush. Hope things ease up for you. Maybe I'm being overly cautious, but Black 60 feels important, to finish the job here. JamesA: White 51: OK, you were probably expecting the cut so I will play it. Let's see what tricks you can come up with here. The last few moves have passed without comment - once this fight is concluded (probably still quite a few more moves!) we'll do some analysis. Scartol Black 52: I'm willing to admit that I don't have as much of a plan as I wish I did. I figure if nothing else, I can push and claw and scratch my way into the north here and do some damage. JamesA: White 53: I'm happy to do what I'm told here. Did you read out some variations before playing Black 50? If so, what did you see and are things going according to plan? Take your time over your next move, I'm away until 12th July. Scartol: I did, and this is basically what I envisioned -- you cutting me off, me barrelling into the top. I figured that even if I couldn't rescue the stones on the right, I could use them as a decoy as I pushed in.. It's worked in the past for me; sometimes I can cause enough collateral damage to offset the loss of the five or so stones..
JamesA: Good, That's the right kind of way to use the hasami. Let's see how much damage you can do here though! 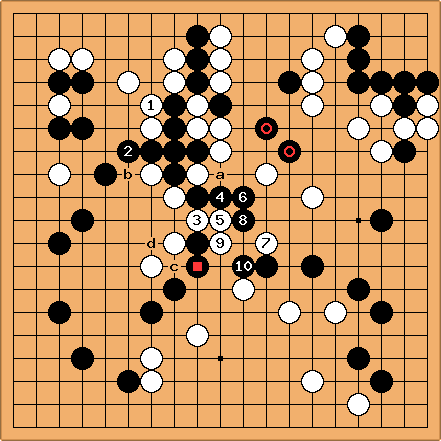 Scartol: I've had plenty of practice lately with using stones I'm going to lose anyway.. <g> Let's make things interresting with Black 56. JamesA: Had to think a bit about White 57... It looks natural though and I couldn't find a way for Black to punish it. Let's see what you have come up with. JamesA: White 59 - the question is: can you save the cutting stone? My move indicates what I think the answer is but what does your reading tell you? Scartol: Yeah, I think I can make it useful. I don't have a plan for what happens after 7 here, but it seems like I can cause some kind of trouble, which will help. JamesA: Hmmm.. I must admit that I can't see any trouble stemming out of 1-7 below... 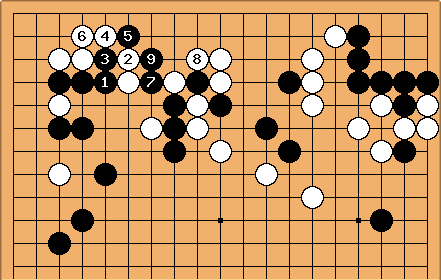 It looks like a straight capture for white with very little aji remaining. unkx80: It appears that Black 58 could be played as either of the two diagrams below. In both cases, White suffers damage on the upper side, no? JamesA: I think White should response to Black 1 with 2 here. Although White has to sacrifice the marked stones I don't think Black can penetrate the top fully (or at least sever the connection between White's groups here). JamesA: OK, White 41 - I'll see what can be done with that lonely white stone. 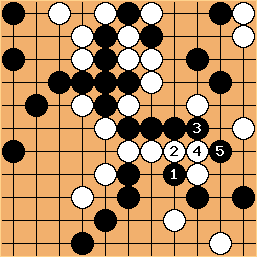 I'm just wondering why the top right corner went so wrong for Black - I think the answer probably lies in the aji that remained when Black answered White 21 at Black 22. It is very rare for a contact move like to White 21 to go unanswered, except perhaps where it is a ko threat. The reason is that whoever plays first in a contact fight will gain a large advantage locally, and to leave two stones in contact means a lot of aji will remain. I would like to say a little about answering White 21 as you didn't appear to consider the usual responses to this kind of move. This is probably the standard aggressive response. White has to think carefully about what to do next. If White extends then he becomes a little heavy. Black can then play at 3 to undermine White. If white then plays at a, Black can attack strongly (due to Black 3) by playing at b. Alternatively Black could just play 3 at a. Perhaps White might cross-cut with White 2 here. I think Black 3 after this puts White in a very difficult position - if White plays at a Black can simply extend at b and White is in trouble. 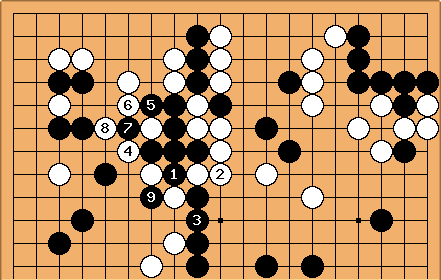 If white plays under with 2, Black 3 seems fine. 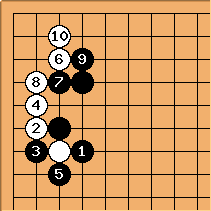 If White extends with White 4, Black 5 gives Black a good position. White will more likely extend with 4, then live in the corner. Of course, this result is excellent for Black - his thickness is enormous. White's profit is small. 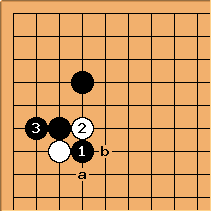 The other main responses for Black would be a and b. c is usually too submissive (Black gains almost nothing and White gets some useful aji - a straight gain for White). 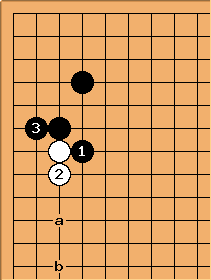 Have a think through White's responses to a and b - Black should always be able to get a good position. To summarise, Black should be very careful about ignoring a contact move like White 21 - your instinct should be to answer with one of the moves above. Only play away if you have a very good reason to! Scartol: The short answer is: My mind wasn't on the game. I probably responded to White 21 while I was at school, after an insane day of insane 13-year-olds, before I tackled a mountain of essays. I probably looked at the board quickly, panicked when I saw the corner getting crunched, and played the first move that looked right. I know I'm supposed to hane when someone attaches to me -- I just wasn't thinking. As for Black 42, I'm very worried about losing the marked stone. But I feel like I still have options if White decides to try and surround it. Keeping the lone white stone trapped seems more urgent. JamesA: Hmmm, actually we discussed Black 22 - or at least you came up with some possible lines. What worried me was that the hane was not even one of the options you considered - it should be automatic. Scartol Black 44: Hmm. Maybe I don't have as many options as I thought..
JamesA: White 45 - let's see where this leads. Of course, I have to connect here. Scartol Black 46: I feel somewhat desperate here, I'm willing to admit it. But I also feel like something should come of this..
JamesA White 49: I really feel I'm starting to get the hang of knight jumps now! Scartol Black 50: Maybe this will help, maybe it'll only make things worse..